If the thought of a Big Mac wasn't enough to make your mouth water, you can now have the juicy burger on your wallpaper, thermal underwear, and rain boots. 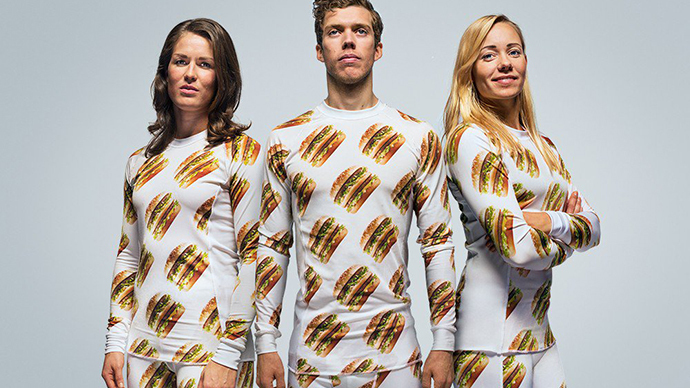 All this is made possible via McDonald's Big Mac Shop collection – but only in Sweden. The collection was launched at the MacWalk fashion show in Stockholm. The design of the Big Mac Shop isn’t the most original, as it features lots of repetitive pictures of Big Macs – as you might expect. But at least you won’t break the bank buying the merchandise; Big Mac bedding will set you back US$47 and the wallpaper $54. But sadly, it seems the rain boots and dog clothing have already sold out. According to AdWeek, the launch was part of McDonald's ‘Day of Joy’ – a marketing push in 24 cities which included 24 events in 24 hours. Called 'imlovinit24,' the campaign saw a massive Big Mac jigsaw in Madrid. In Manila, drivers were treated to free food. Vienna residents were invited to listen to a McOrchestra. In London, pop star Jessie Jay performed a gig on a double-decker bus. Across the pond in New York, singer Ne-Yo sang a 'Lovin' anthem composed of crowd-sourced lyrics. But it remains unseen whether the clever campaign will help boost the fast-food chain's sales, which are at their worst in a decade. Profits from the Big Mac Shop will go to Ronald McDonald House Charities.